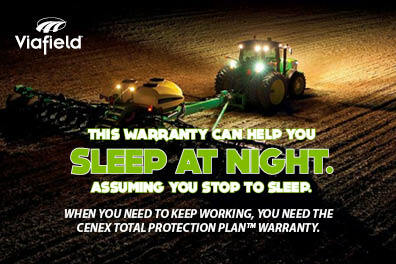 Consider protecting all your equipment with the Cenex Total Protection Plan. It’s a small investment to make in exchange for valuable coverage and peace of mind. You get unsurpassed coverage while helping to ensure that only high-quality energy products go into your equipment. Think of it as a no-fault insurance policy — one that helps keep you in the fields when you need to be there. There’s no deductible, which can really pay off and help keep things moving during crunch times like planting and harvest. When you use Ruby Fieldmaster® Premium Diesel fuels and Cenex® lubricants exclusively, you get up to 10 years or 10,000 hours of engine and transmission coverage. You also have the option of exclusively using Maxtron® lubricants — with any fuel you choose — for the same great coverage. Whether you buy new or used equipment, you simply won’t need a better way to protect your investment. What makes this the best warranty in the industry? For great coverage and a great value, contact your Viafield Energy Sales Specialist today.